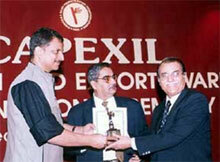 Minister for state for Commerce and Industry Mr. Rajiv Pratap Rudi (on the left) giving away export award to Mr. Vinay Sarin, Executive Director, Marketing, Hindustan Composites Ltd. (on the right). Mr. M. F. Vohra, Chairman, Capexil (in the centre). Products are being exported to more than 30 countries. Major markets covered are Latin America, Greece, Middle East and South East Asia. Export turnover US $ 2 Million. Range of Asbestos Free products developed for automotive applications including HCV + LCV Brake Liners, Random Wound Clutch Facings, Moulded + Woven Roll Linings. Product Certification from AMECA obtained for Asbestos Free product range consisting of Heavy Duty Drum Brake Linings, Disc Brake Pads, Woven Clutch Facings, Roll Linings and Friction Sheets. Asbestos Free Liners being supplied for popular Heavy Duty Vehicles like Man, Mercedes Benz, Scania, Ford, Trailers etc.